Contact us at Outwest Party Hire for bookings or enquiries. Whether you’re planning a wedding, a corporate occasion or getting ready for a market day, a marquee is one of the best ways to create a beautiful, welcoming outdoor environment. With a marquee, you can provide shelter for guests from the elements, a location for special events and space where everyone can get together to enjoy the festivities of the day. 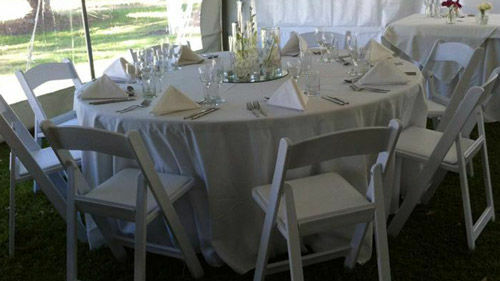 However, there are several aspects to consider when choosing a marquee, such as the marquee flooring. With many different options available, it’s always wise to collaborate with the business you’ve chosen to rent and install your marquee, to be sure you get the right flooring for your needs. Meanwhile, to get you started, here is an overview of some different marquee flooring types and what you can expect when you require marquee flooring hire. Marquee flooring comes in a variety of options, so you can easily find what you need when you work with a business such as Outwest Party Hire. For example, carpeting is a common choice for those seeking a firm yet comfortable floor for their marquee. Available in many different colours, you can also choose carpeting to cover marquee flooring depending on the reason for your hire. Of course, carpet is by no means the only type of marquee flooring available. Other marquee flooring options include floorboards made of materials such as vinyl, or even timber. These are just as solid and secure as carpet, but are often chosen over carpet for events where guests expect dancing. With firm floorboards, your guests will be able to dance all night long and talk about the event for years. After you have made some decisions regarding the type of flooring you want, it is still essential to ensure that you get quality flooring for your event. After all, you want to be sure that the ground your guests walk on is as stable and secure as the roof over their heads. That’s why it’s smart to find a business that can provide flooring with the installation of a marquee. Having a variety of marquee flooring options is important, but equally necessary is ensuring the safety of everybody who enters the event space. That’s a philosophy that we at Outwest Party Hire abide by in everything we do and is just one of the many reasons you can expect the best quality flooring, and other event products when you choose to work with us. You can learn everything you need to know about Outwest Party Hire, including prices of some of our most popular products available for rent, by browsing around our site. If you do choose to work with us, know that we’ll do everything in our power to provide you with a quality experience as well, ensuring that everything goes smoothly from the moment you place your order to the time we come to pack up.